The list of Bible Verses for mental health is towards the bottom of this post. 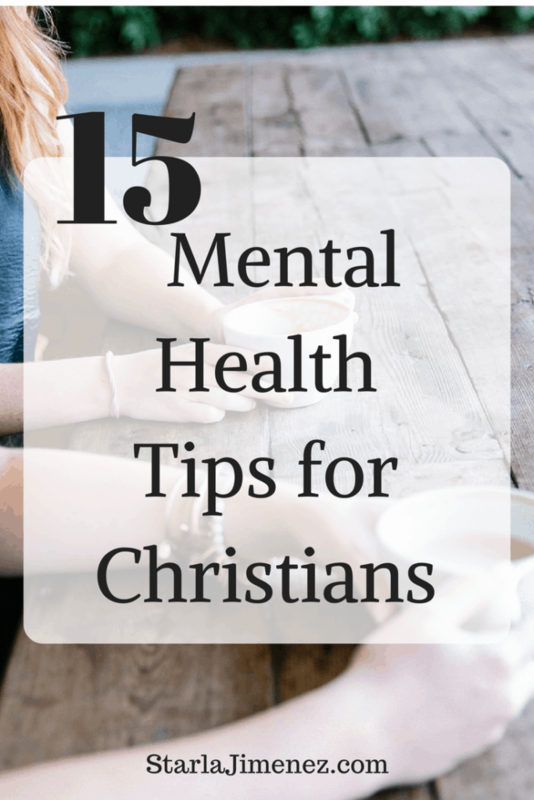 Mental health for Christians can be a risky topic to discuss, depending who is sitting at the table. Unfortunately, mental health still holds a stigma in society. Yes, even in the church. MentalHealth.gov describes it like this: Mental health includes our emotional, psychological, and social well-being. It affects how we think, feel, and act. It also helps determine how we handle stress, relate to others, and make choices. Mental health is important at every stage of life, from childhood and adolescence through adulthood. According to 2014 research by evangelical polling organization Lifeway, only 27 percent of churches have established plans to help families affected by mental illness. Nearly two-thirds of religiously observant Protestant Christians with depression reported wanting their churches to speak openly about mental illness, but 66 percent of pastors said they spoke to their church on the topic once a year or less. This article says their survey also finds one-third of victims were attending church before their death, but few pastors knew of their struggle. It’s good to recognize there is a problem. Denial may keep you stuck in the yuck. Breaking all negative thought processes is important. Get out of that “stinkin thinkin”. You are important, needed and loved. You deserve to get the help, counsel and medical attention needed to get through this. When you pray, ask God to put the right people in your life to help and encourage you. 4. Don’t feel ashamed to get the help or medicine you need. You wouldn’t suggest someone with cancer, diabetes or Lyme disease to go without seeking medical help, so why would you deny yourself the help you need? 5. Don’t stop your medication without talking to your Dr.
A friend of mine stopped taking her meds because her husband complained it made her fat. (insert angry face emoji here) So she stopped her meds in hopes of keeping her husband happy. In the end, he left because of her mental roller coaster. She tried so hard, but she needed the medication. Don’t stop taking your meds without speaking to your Dr first. 6. Journaling/Tracking your days will help you observe any patterns. Keeping a daily journal of what is happening in your world, how many hours you sleep, what you are eating, amount of exercise you get, how you are feeling, etc will all help you and your counselor and or Dr get a better overall picture of any patterns that may be happening in your life. 7. Work to be happy. Perfection is overrated. Sometimes it’s ok to just make it to feeling ok.
8. Make a note of 3 things you are grateful for. It’s really hard to feel down when you are focused on the good things in your life. We all have things to be grateful for. Keeping a gratitude & prayer journal is super helpful. 9. Let people help you. There is no shame in asking for help. That’s what family and friends are for…..share the load! Setting boundaries makes us responsible for our own feelings, choices, thoughts, actions and desires. It also let us and those around us know what we are not responsible for. There is no quicker way to resentment than saying yes to everyone and everything. Living an overwhelmed life is not living the life that God wants for you. 12. Allow yourself time to grieve your loss, just don’t stay stuck there. It’s ok (and don’t let anyone rush you) to grieve you loss. Feel sad. It’s ok. Just don’t get stuck there. Make sure you are taking steps to move forward. 13. Storms in life can be good for us. Hard times in life can help us to grow as a person, grow our character, grow in wisdom, grow in compassion and grow in our faith in the Lord. 14. Third Party Perspective is good. My counselor told me once to compare my situation to that of a friend or family member I loved. Would I want my loved one to go through what I’m going through? What advice would I give my friend? Then take your own advice. 15. Jesus should be the first one you turn to. Pray. At times it may seems like God is absent, but He is not. We can be so easily deceived, especially while we are in pain. Make your daily prayer and bible reading time a high priority in your life. The closer you walk with Jesus, the more healing and wisdom He gives us. I hope this article brings some type of encouragement to you. Especially if you or someone you know is suffering with mental health issues. You are worthy of good things. You are loved. You are wanted. Christian self care is a hot term these days. In Christian circles it can be viewed as negative or selfish. I assure you, the Bible backs up Christian self care, without using those specific words. Check out these 13 Christian Self Care Tips!